Strangely, there are two cello-related gigs tonight. Cellist Nick Dinnerstein has played, studied, and performed in various settings around the world, and he also happens to read this little ol' site. He and pianist Pei-Yeh Tsai will perform a "beautiful French sonata by Franck and some fun Tango Etudes by Piazzolla". The booker at Hennessy's is a big fan of Chameleons UK, and he successfully got Mark Burgess, the main Chameleon to do a one-off Boston gig last year. Apparently it worked out well, because Burgess and his touring are making a full-fledged stop on their US tour. While I wasn't a huge fan of The Chameleons UK, they were one of the cool new wave bands -- like the more popular Cure and Echo & The Bunnymen -- whose music holds up really well. Endless Wave is a good choice for opener as a modern band who sounds like they've listened to a bunch of these classic albums. You may want to consider to pay more for advance tix. I think Robin Ryczek may have played cello with Copal all of the groups on this bill. In a rather admirable career choice, she's leaving to teach at the Afghanistan National Institute of Music. Beside being a public farewell party, it's also a benefit to raise funds for her expenses for travel and for organizing workshops while she's there. It should be an eclectic night of rock/folk/gypsy/circus/world music with good tunes and vibes in abundance. If you want to help and can't make it tonight, I think Robyn would love to hear from you. Ryan's Smashing Life presents an interesting musical mix. Making her Boston debut Anna Rose is classic-rock-loving, singer-songwriter chick with a great voice who took guitar lessons from the guy who's made more instructional videos than anyone, and her dad happens to be an Oscar-winning composer behind stuff like "Little Shop of Horrors" and "The Little Mermaid". With whatever expectations one might have, it's still pretty good folk/pop/rock stuff. There are two excellent local groups playing if Anna doesn't turn out to be your cup of tea. One of favorite elements of The Hush Now is that I get the impression there's a lot of care and thought to the music as opposed to bashing out their poppy indie-rock. 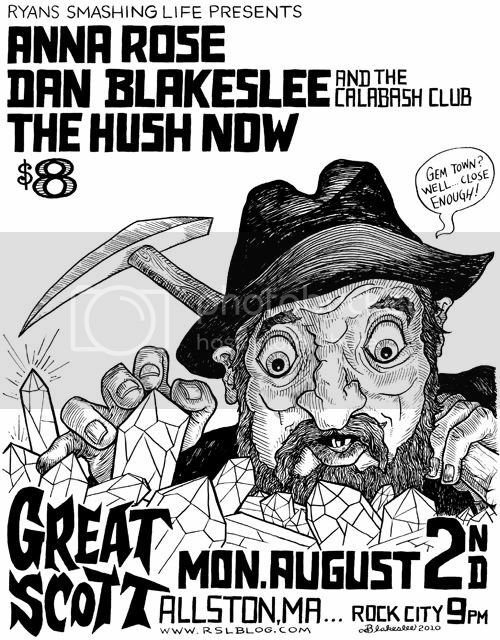 As you can see from the flyer above, Dan Blakeslee's talents are far from limited to guitar and song. I get a peculiar vibe from his compelling and literate folky tales.